During the regency era, there were three particular luxury drinks: tea, coffee and chocolate. They were in high demand, but expensive to acquire and, in the case of chocolate, difficult to make. Now of course luxury drinks needed accessories to go with them, just like our iphones need fancy cases—gotta show off the bling, right? Proper hostesses would do exactly that with specialized cups and pots for each beverage. The differences between the pieces were not random though, they were based on the way the drinks were created and enjoyed. Rather scientific, if you think about it. Drinking chocolate was often prepared in a large saucepan and then poured into special pots, known in France as a chocolatière, designed just for serving it. At first, when chocolate was a luxury limited to only the most elite, chocolate pots were made exclusively of silver with fine hardwoods or ivory used for the finials. 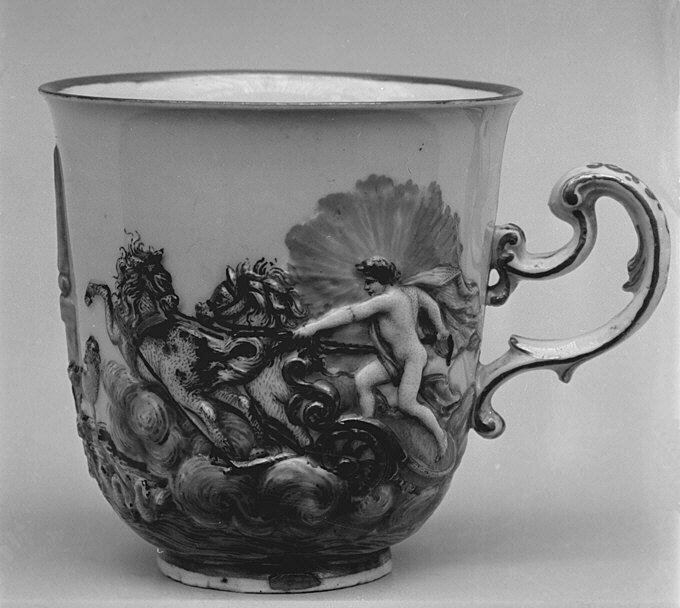 In the early 1700’s, porcelain chocolate pots were made in China for export to Europe. Later, sturdier (and less expensive) pots were made of pewter or earthenware. 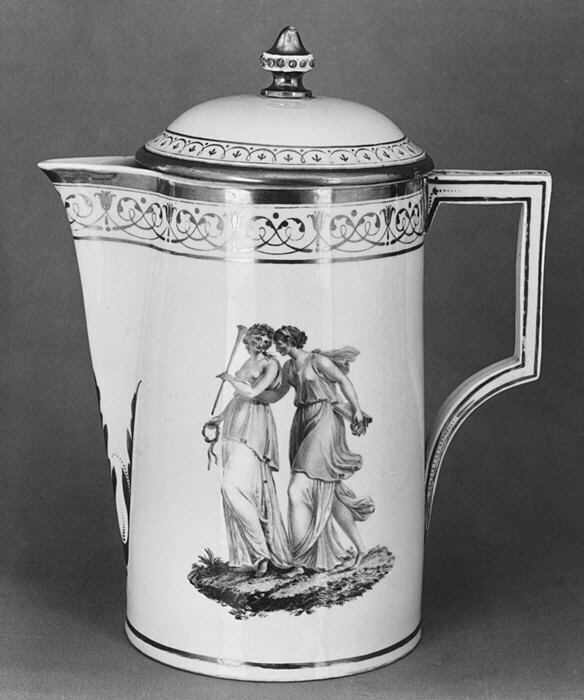 Chocolate pots tended to be tall and relatively slender, looking a lot like coffee pots, but with a few significant differences in the lid, the spout and the handle. Drinking chocolate was very thick and tended to settle, so it was essential to continue whipping it with the molinet. 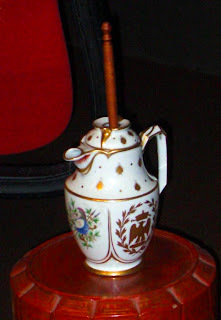 To accommodate the molinet, a chocolate pot had a very distinct lid. The top of a chocolate pot had a hole for the molinet handle to extend from, allowing the hostess to stir the chocolate without splashing herself or her guests. The hole might remain uncovered, but in many cases a special hinged or swiveling finial would cap the hole and help preserve the heat in the chocolate. Sometimes the finial might be attached by a chain to the pot so it would not get lost. Spouts on chocolate pots were wide and set high on the pot. Both qualities relate to the froth on the top of the chocolate. Since the froth floats on top of the chocolate, locating the spout high helps to capture the foam. Similarly, a wide spout facilitates getting it into a serving cup. A high spout also helps to keep the undesirable sediments that settled to the bottom out of the serving cups. The earliest chocolate pots had handles set at right angles to the pot. Usually these were made of wood, with a bit of a knob at the end. 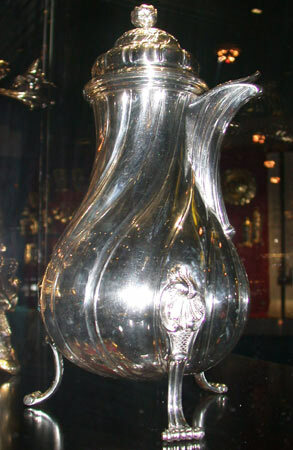 After the later part of the 1730’s, chocolate pots with looping handles in line with the pouring spout were produced. Drinking chocolate was thick, even syrupy, very different from tea or coffee. Its thickness, and the need to preserve the froth on top meant that special cups were required to properly enjoy sipping the chocolate through the milky froth. Here's where it gets particularly interesting--to me at least. Chocolate cups were taller and narrower than coffee or tea cups. This would force the foam into a thick layer on the top and keep it from dispersing so quickly. Their unique shape also gave them a high center of gravity, which in English means it made them more likely to spill, especially if one's hands were less than steady. That problem gave rise to a whole new style of china. The trembleuse or tasse trembleuse originated in Paris in the 1690's and was designed to allow those with trembling hands to drink with greater ease. It consisted of a cup, often with a lid and two handles, and a saucer with ether a deep well or a raised rim that steadied the cup and kept it from tipping. In contrast, teapots tend to be short and stout (remember the kids’ song?) The round shape allows room for the tea to move in the pot, allowing it to steep more effectively. Their short spouts come from the center of the pot and sometimes have a grate behind to keep the tea leaves from clogging the spout. The short length makes them easier to clean if leaves get trapped inside the spout. Because tea steeps near boiling, it must be slightly cooled before drinking. A tea cup has a wide open rim that tapers down to a smaller base and a handle designed to hook a single finger, all purposed to help cool the tea and prevent burns. In many ways, coffee serving pieces do the opposite. Coffee pots are designed to help maintain the heat of the beverage, which preserves its flavor. The taller, narrow shape helps minimize heat loss. The longer, low-mounted spout helps keep cool air from circulating into the pot. Coffee tastes best when served hot. Since it brews at around 180F, burns are not as much a concern as keeping the beverage hot. So coffee cups have a more vertical, cylindrical shape and bigger handles to accommodate two or three fingers which helps them conserve the beverage's temperature. 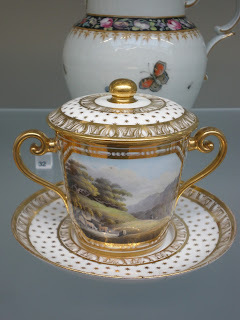 A proper regency hostess would have had all three sorts of china in her collection and been able to identify these pots at just a glance. In all likelihood, she would not have considered serving chocolate from anything but a chocolate pot. For the rest of us though, chocolate served from another sort of pot would still be chocolate, right? And that has to be a very good thing indeed. Deitz, Paula. "Chocolate Pots Brewed Ingenuity." The New York Times. February 18, 1989. Accessed May 24, 2017. http://www.nytimes.com/1989/02/19/arts/antiques-chocolate-pots-brewed-ingenuity.html. Kane, Kathryn. "Regency Chocolate: The Correct Accoutrements." The Regency Redingote. August 02, 2011. Accessed May 24, 2017. https://regencyredingote.wordpress.com/2011/05/20/regency-chocolate-the-correct-accoutrements/. Righthand, Jess. 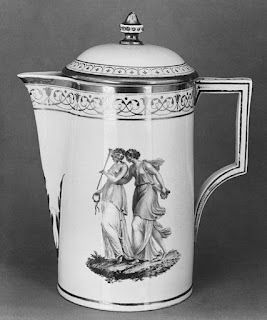 "A Brief History of the Chocolate Pot." Smithsonian.com. February 13, 2015. Accessed May 24, 2017. http://www.smithsonianmag.com/smithsonian-institution/brief-history-chocolate-pot-180954241/. Though Maria Grace has been writing fiction since she was ten years old, those early efforts happily reside in a file drawer and are unlikely to see the light of day again, for which many are grateful. After penning five file-drawer novels in high school, she took a break from writing to pursue college and earn her doctorate. After 16 years of university teaching, she returned to her first love, fiction writing. Click here to find her books on Amazon. For more on her writing and other Random Bits of Fascination, visit her website. You can also like her on Facebook, or follow on Twitter. Maria, Thank you! I didn't know that. :) What a delightful post. Beautiful pictures and wonderful, informative article! Thanks! Comments with opposing viewpoints are allowed if they are not written in an unnecessarily confrontational or arrogant manner. Britain leaves us awed by ancient castles, palaces and museums. History pours out a legacy of battles, a developing monarchy, a structured class system, court-inspired behaviors and fashions, artwork and writings that have created a love for all things British. Some of us feel that we must fuel the fire~ we have come together to share our historical work and to reach out to our much appreciated readers. Please enjoy our posts about the history of England, Scotland, Wales and all the Empire. 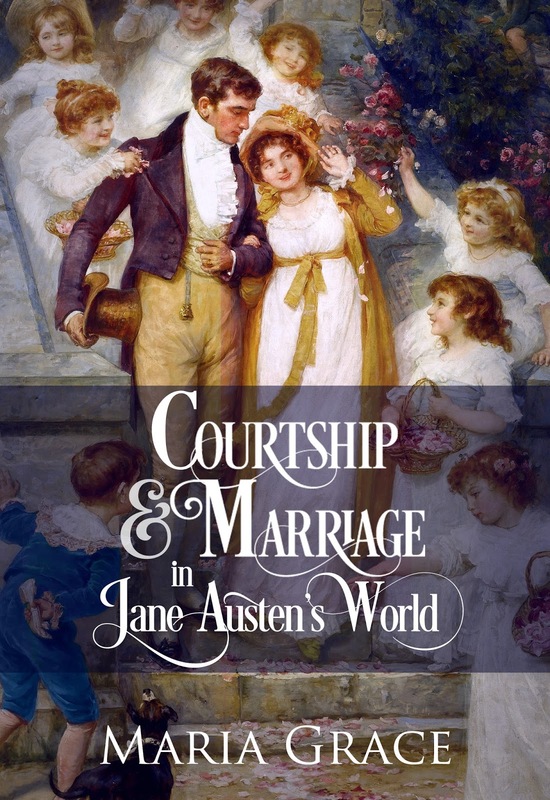 The second volume of our Anthology. Articles by fifty authors. Profile picture: This file is licensed under the Creative Commons Attribution-Share Alike 3.0 Unported license. Debra Brown 2011. Watermark theme. Powered by Blogger.